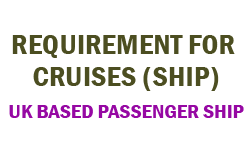 CDC/STCW2010 (BAHAMAS, LIBERIAN, PALAU and PANAMA (10/11/2017) Charges are refundable. Candidates with valid TOEIC Certificate and above mentioned valid CDC types need not pay respective Charges. Documents to carry Resume, Original Passport, White Background Photo – 5 Nos, Education and Experience certificate. After VISA reasonable service charges applicable.